PORTLAND — The only thing slower than your daily commute, it seems, is the process of deciding whether, when, and how to toll the interstate highways in Portland. At a meeting on Monday, Oregon transportation officials and the 25-member Public Advisory Committee tasked with implementing the Oregon Legislature mandate to explore tolling in Portland narrowed their options to three, down from the original eight concepts. 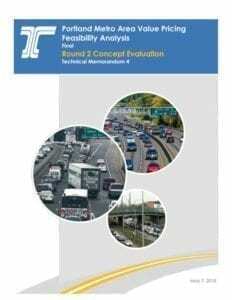 Committee members were given 147 pages of analysis about the various Value Pricing concepts, and why WSP Consulting, which is working with ODOT to evaluate the plan, recommended dropping two of the five concepts that had made it to this point. Among the concepts not making the cut were one that would have created a single tolled lane on I-5 north and southbound in North Portland, and another that would have tolled all lanes of I-205 between Stafford Road and the Abernathy Bridge in Oregon City. In the first case the consultants found that, while the cost of implementing the plan would be lower, there would be minimal congestion relief for the unpriced lanes. In the second case, the tolls likely would have generated very little revenue. The committee has a month to finalize their recommendations before presenting their findings to the Oregon Transportation Commission. The state will submit a request to the Federal Highway Administration by the end of the year, but it’s believed it could be as much as a decade before tolling can actually be implemented. 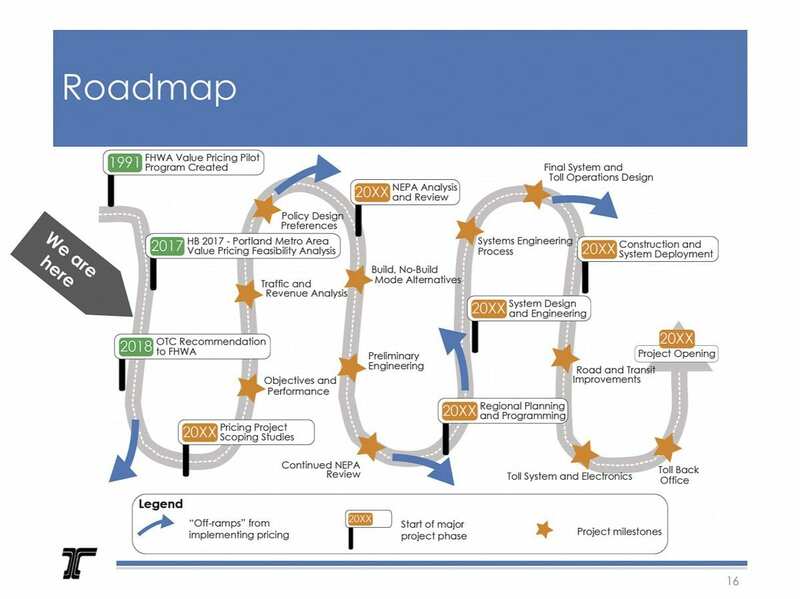 David Ungemah, with WSP, displayed a graphic showing a winding road to illustrate how early on the process actually is. The consulting group is recommending that ODOT consider tolling all lanes of I-5 between Going Street to the north and Multnomah Boulevard to the south, otherwise known as Concept B. That option, they concluded, had strong potential to reduce congestion along I-5, without diverting a great deal of traffic over to I-205, due to the alternative transportation options in that corridor. That plan would also generate an estimated $50 million in gross revenue annually, though little information was available about how much Oregon could expect to actually keep. Concept B would be contingent on the completion of the $450 million Rose Quarter/I-5 project designed to cap I-5 in some places and ease congestion around the I-5/I-405 interchange. The group further recommended that ODOT might consider also tolling the Abernathy Bridge on I-205 at the same time, or else phasing that toll in shortly afterward. 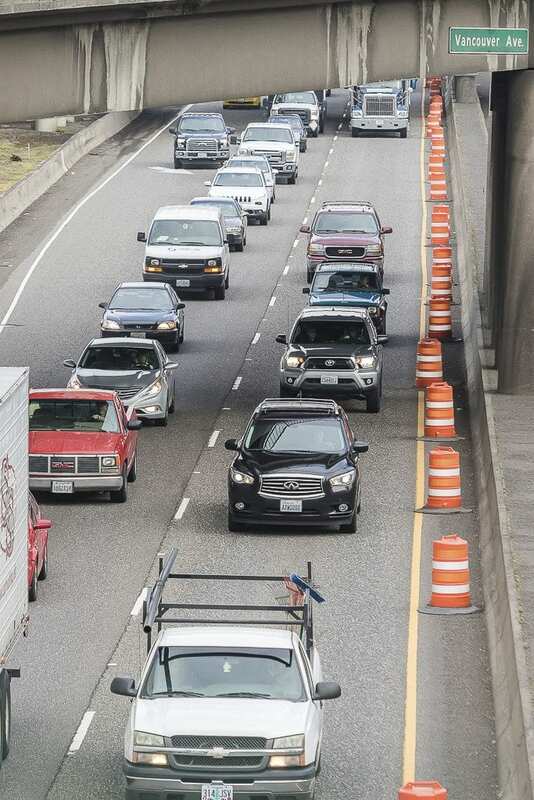 That plan, known as Concept E, would generate between $300 million and $550 million in revenue over a 30-year period, and the money would likely be used in part to expand I-205, but not to replace the Abernathy Bridge. While the option of tolling all lanes of both I-5 and I-205 was not taken off the table, it was relegated to the least preferable alternative. While the study concluded that concept would decrease highway congestion the most, and generate the most revenue, there were also concerns about driving high volumes of traffic into surrounding neighborhoods. It was made clear that, assuming the other options are implemented first and succeed, it’s likely all of I-5 and I-205 would eventually be tolled in some capacity. There have been rumblings among the Public Advisory Committee that it seems as if their opinions in the process have been largely unheeded, with the recommendations being driven almost entirely by state staff and the consulting firm. 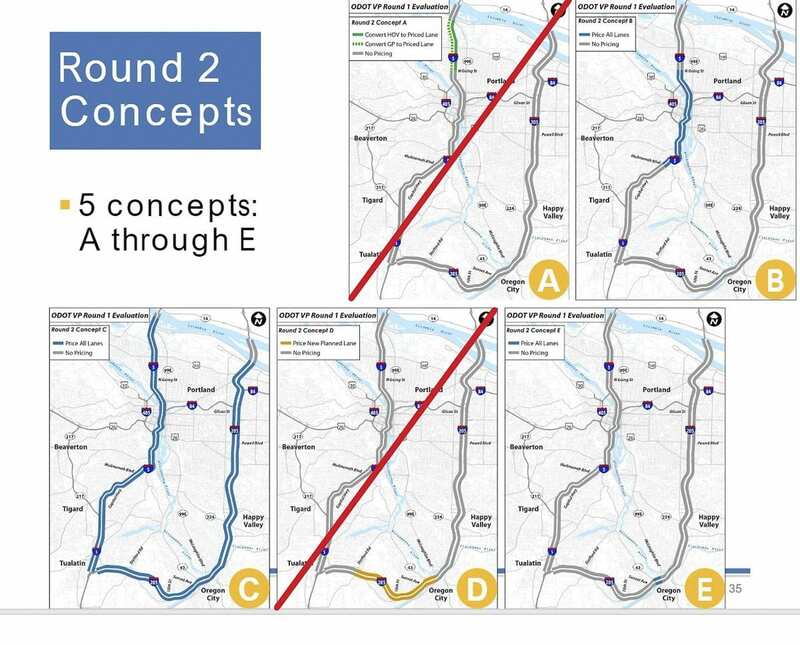 A number of members had asked whether Concepts D and E could be combined, ultimately tolling I-205 at Stafford road, but also including the Abernathy Bridge. That recommendation did not move ahead. Despite the apparent discord, Vancouver Mayor Anne McEnerny-Ogle said she’s happy to at least be included in the conversation, and pleased that the option of tolled lanes on I-5 in North Portland are off the table. That last point was a topic also brought up by Clark County Councilor Eileen Quiring, and Washington County commissioner Roy Rogers, who said it was a “non starter” for him if the state wouldn’t commit to using revenue from tolls to increase traffic capacity. The Advisory Committee clearly has no consensus about which direction they should go, but were reminded multiple times during the meeting that they are not a voting panel, and consensus wasn’t needed in order to move forward. The group will meet for the final time on June 25 to firm up their recommendations, which will go to the Oregon Transportation Commission. The first chance the public will have to weigh in with OTC will be at their meeting on July 12.